Organisers confirmed the band would fill the vacant slot on the Somerset venue's iconic Pyramid Stage, sandwiched as the headliner act over the three nights between Arcade Fire and Kasabian, whose attendance had already been announced. They join Dolly Parton, Jack White and Elbow on the main stage. It will be the first time Metallica, known for hits including Enter Sandman but who recently collaborated with the late Velvet Underground frontman Lou Reed, will have performed at the festival. 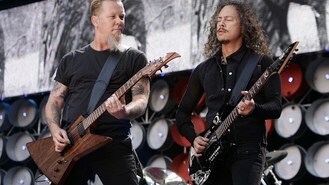 Organiser Michael Eavis said: "Metallica are one of the most popular bands in the world, and they really are a phenomenal live act. "There's a huge swathe of people who love Metallica to bits and just think they're absolutely amazing. They're worthy headliners." The War On Drugs, Nick Mulvey and English National Ballet have also been added to the Pyramid Stage line-up, while HAIM, Bombay Bicycle Club and The Horrors are new additions to the Other Stage running order. Rumours over the mystery Saturday night slot saw the likes of perennial favourites David Bowie and Prince linked, while organisers' suggestions that the vacancy would be filled by a reforming band saw bookies shorten odds on Fleetwood Mac and Oasis. Eavis said: "We've never been ones to just book the safe options. We had Jay-Z and Kings of Leon in 2008 when everyone seemed to think neither were capable of headlining here. And Coldplay in 2002 when they'd only released one album and people thought they weren't ready. "Even in 1984, a lot of people were quite put out when we had the Smiths. Isn't that funny? But all of those worked out pretty well. "And there have been so many others over the years. We want our line-up to be exciting and different. That's what we're here for." The full line-up is available from glastonburyfestivals.co.uk. The festival officially runs from June 27-29.